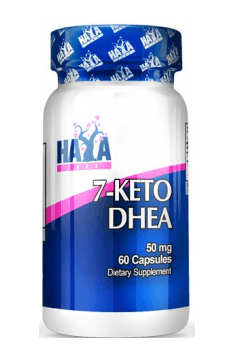 7-Keto DHEA 50mg 60 caps. 7-Keto is a useful dietary supplement for people who want to support healthy weight control, including physical activity and a balanced diet. The standard dose of 7-keto is 200-400 mg per day in two doses (100-200 mg). The best time for supplementing 7-keto is the morning when its natural production in the body increases. Taking 7-keto according to the natural cycle of the organism makes it more bioavailable. It is not recommended before bedtime as an elevated 7-keto level in the evening gently stimulates the nervous system and it may cause sleep problems.